The artistes tuned their instruments, a constant hum of tamburas was under way and the crowd of over 500 people waited in anticipation. BENGALURU: The artistes tuned their instruments, a constant hum of tamburas was under way and the crowd of over 500 people waited in anticipation. After about five minutes of tuning and adjustments, which added to the build-up, Bombay Jayshree, one of the country’s most renowned classical vocalists, began her rendition, and finally the 79th edition of the National Music Festival was off to a musical start. The month-long, annual festival of classical music, organised by Sree Ramaseva Mandali, is touted to be the biggest of its kind. It was inaugurated by Prince of the Mysuru royal family Yaduveer Krishnadatta Chamaraja Wodeyar here on Wednesday, and was timed to begin on the occasion of Ramanavami — the Hindu festival that celebrates Lord Rama’s birthday. Some illustrious names have been associated with the programme. 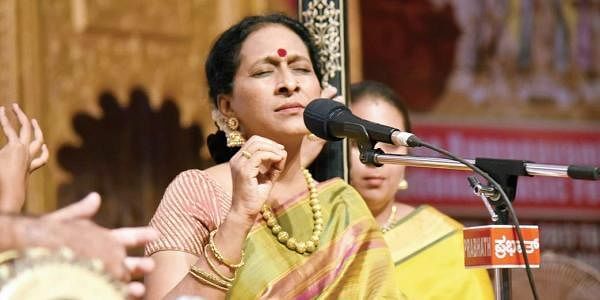 Vocalist M S Subbalakshmi had performed as many as 36 times at the same venue, the most she has performed at any music festival. The founder of the Mandali, S V Narayanaswamy Rao, began the organisation at the age of 14 on the footpaths of 3rd Main Road, Chamrajpet. Yaduveer spoke about his family’s association with the event. He said, “My family has been deeply ingrained in culture and has always added value to the society. Music has been an important part of our heritage Â- Chamaraja Wodeyar was a violin virtuoso while Jayachamarajendra Wodeyar played multiple instruments. The other dignitaries present at the inauguration were president of Kannada Sahitya Parishad Dr Manu Baligar, DG and IG of Police Rupak Kumar Datta, MD of State Bank of Mysore N Krishnamachari and Additional DG of Police Bhaskar Rao.